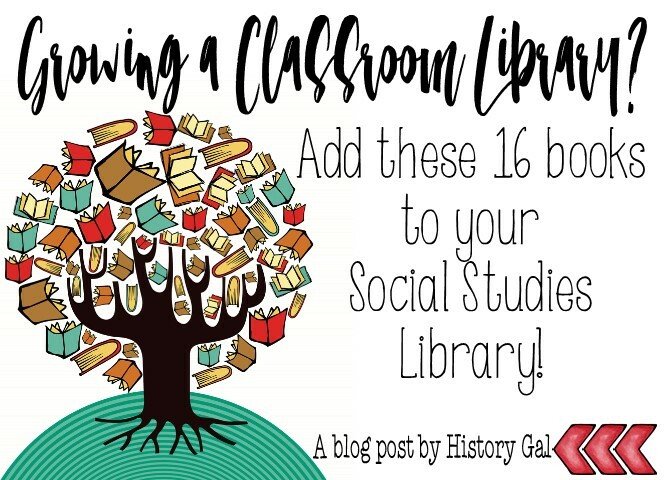 Lately, I've been daydreaming about creating a social studies classroom library. When I see the amazing collections amassed by my friends who teach ELA, I think back to the collection of thirty year old encyclopedias, old textbooks, and atlases that made up my classroom library when I was in the classroom. They definitely served a purpose, but students weren't exactly excited to use them. What if teachers added books to their libraries that hooked students and made them want to learn more? What if the books made a foreign culture or time more relevant? What if the books were just fun to read? What if the classroom library became a spot that students liked to go to and were excited about? While I was creating a wish list of books for my dream library, I realized I didn't have many recent books on my list. 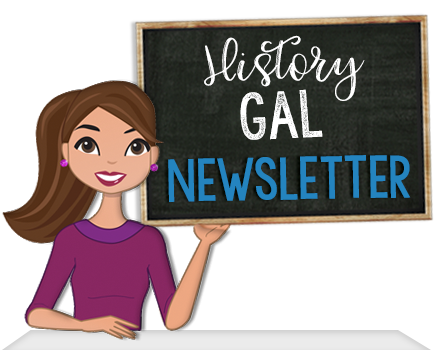 So, I asked my good friend and ELA teacher, Rachel of Writing by Rachel, to make me a list of recent books that should be added to a middle school social studies classroom collection. Here are her amazing suggestions. Calico Girl by Jerdine Nolen. As the Civil War rages, twelve-year-old Callie Wilcomb and her family attempt to break free from the bonds of slavery. A Kirkus Reviews Best Book of 2017. The War that Saved My Life by Kimberly Brubaker Bradley. Ada was born with a clubfoot, a fact that embarrasses her mother who forbids her from leaving the house. So, when Ada’s brother is sent out of London to escape the War, Ada takes advantage of the opportunity and sneaks along. Free from her mother, Ada can leave her new house, and form bonds with new people. What will happen to Ada when the War ends? Winner of the 2016 Newbery Honor. Betty before X by Ilyasah Shabazz. Inspired by Betty Shabazz’s life, this fictionalized account of 11-year-old Betty’s experiences will resonate with all teens searching for purpose and acceptance, and will introduce readers to Betty Shabazz against a backdrop of pre-Civil Rights era social protest. Amina’s Voice by Hena Khan. Amina, a Pakistani-American, must balance two cultures: her rick Pakistani heritage and home life with her American school. When her mosque is vandalized, Amina discovers her voice is even more important. A Jewish boy in 1930s German. A Cuban girl in 1994. And, a Syrian boy in 2015. Three young adults in search of refuge. Their stories draw connections between events and themes that are at once historical and timely. With time, our attention to older books often fades. But, this still deserves a place on your history shelf. It shines a light on a commonly taught place and time, and is still revolutionary in how its detailed illustrations work with the text to reveal the intricacies of Roman cities and design. Witches: The Absolutely True Tale of Disaster in Salem written by Rosalyn Schanzer. 300 years later, we are still mesmerized by the Salem Witch Trials. Schanzer’s Siebert winning Witches combines primary source documents with an engaging and unbelievable but true narrative that transports readers back to a dramatic time of ‘witches,’ lies, and ruined lives. Jerry Springer has nothing on history! An American Plague written by Jim Murphy. Murphy takes readers back to 1793 and, with engaging writing and thorough research, leads us through the social and political aspects of the plague, as well as how doctors responded. Winner of a Sibert Award, this book is a great partner to Laurie Halse Andersen’s popular fictional account of the same time, Fever 1793. Two Miserable Presidents: Everything Your Schoolbooks Didn't Tell You about the Civil War written by Steve Sheinkin. The Family Romanov: Murder, Rebellion, and the Fall of Imperial Russia written by Candace Fleming. Among history’s most fascinating mysteries is that of the Romanov family. Fleming weaves together information about the family and the times to create a page-turning tale with first-hand accounts and photos. We Will Not be Silent: The White Rose Student Resistance Movement that Defied Adolf Hitler written by Russell Freedman. Freedman is known for his clear, eloquent, and accessible writing. All that is true but this book will appeal to students because it focuses on the youth of the White Rose Resistance. Learning about the Holocaust is important, but can be draining. It helps to balance the darkness of the Holocaust with information about people who fought for right and against Hitler. That Freedman’s focus in this book is a brother and sister team, Hans and Sophie Scholl, is even more compelling to young readers. Bomb: The Race to Build—and Steal—the World's Most Dangerous Weapon written by Steve Sheinkin. The story of the atomic bomb is full of risk, lies, spies, twists and turns that will grab the interest of students from page one. Claudette Colvin: Twice Toward Justice written by Phillip Hoose. Nine months before Rosa Parks refused to relinquish her seat, 15-year-old Claudette Colvin did the same. Author Phillip Hoose, who believes youth should be involved in social change, brings us the forgotten story of Claudette Colvin and her persistent efforts amid the civil rights movement. Chasing King’s Killer: The Hunt for Martin Luther King Jr.’s Assassin written by James Swanson. Swanson traces King’s life and importance in America’s Civil Rights’ Movement, and then examines the facts surrounding his death. Packed with primary source photos and notes. Bonus: You can refer satisfied readers to Swanson’s Chasing Lincoln’s Killer. Vietnam: A History of the War written by Russell Freedman. More than other wars, the Vietnam War can be difficult to understand. Why were American troops there? What was it about? Freedman’s Vietnam provides an unbiased overview of a complicated conflict. I am Malala: How One Girl Stood Up for Education and Changed the World (Young Reader’s Edition) written by Malala Yousafzai. Perhaps more than any other young adult, Malala Yousafzai is known around the world as a crusader for education for girls, and for her tremendous perseverance in the face of violence. Few people make a lasting mark on the world and remain known generations later. Malala Yousafzai not only made her mark on today and for generations to come, she did it as a teenager. She is unique and inspirational.